in 3 locations, Boulder, Denver and Colorado Springs. Christian ministry faces a changing landscape in our time, including globalization, wealth gaps, failing social institutions, leadership insecurity, religious extremism, and backlash to exclusive voices. Added to that, Christians in the 2/3rd world now outnumber Christians in the West. Pluralism and tolerance perplex missionaries overseas and church planters in the West engaged in missional activity. Join us as we meet simultaneously with Dr. David Hesselgrave, at three different sites in Boulder, Denver, and Colorado Springs. Using his new book, Paradigms in Conflict as a backdrop, we will discuss six key issues facing the church as it leads in global contexts (chapters 3, 5, 7 & 10). Global leaders will need to solve the big problems in our century, thinking about them from multiple angles, multiple levels and in varying degrees of complexity. How should we approach leaders of other faiths/ worldviews/ ideologies? What is the gospel? Does it call for social transformation or is it simply proclaimed? Are we Christ to others, or do we just represent him in intercultural contexts? Are we under-prepared or over-prepared? What do we keep, leave-out, or change in the culture we enter? Does the Bible interpret culture, or do various cultural contexts interpret the Bible? How does the Great Commission relate to the Kingdom of God, and in turn affect our missional philosophy? Is a leading spokesman for evangelical missions. Now retired, he served as a pastor and missionary to Japan, the co-founder of Evangelical Missiological Society, as well as professor and director of missions at Trinity Evangelical Divinity School. His many books include Communicating Christ Cross-Culturally and Planting Churches Cross-Culturally. He and his wife Gertrude live in Rockfold, Illinois. Dr. Hesselgrave will join “Changes in Mission” by conference call, to kick off the day and answer questions to close the Forum. The forum fee is $59, which includes lunch and Hesselgrave’s book. There is still seating at each location. Register with two other colleagues and save $5 each. Full-time students under 30 yrs old get $20 scholarships and can register for $39. Upon registration, participants will receive David Hesselgrave’s latest book, Paradigms In Conflict (2005), a $20.99 value, by postal mail. Registration is being kept open till November 24th. Changes in Mission Forum is being hosted by various program coordinators in Boulder, Denver and Colorado Springs: Rich Lotterhos, Rich Bledsoe, Georges Houssney, Fran Bloomberg, Bruce McCluggage, and Jay Gary. Registration is being handled by Christian Futures. Questions? Contact, Regional VP, Rocky Mtn EMS, David Diaso <ddiaso@gemission.com> (719) 213-4990. Purpose: To advance the cause of world evangelization through study and evaluation of biblical mission concepts and strategies with a view to commending sound mission theory and practice to churches, mission agencies and schools of missionary training around the world. Program: To foster fellowship and professional stimulation among professors, missionaries/missiologists, mission administrators, and pastors with strategic Missiological interests. 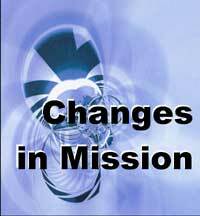 We also welcome students and practitioners of mission. This fellowship exists as a platform for the discussion of missiolgical and theological concerns growing out of the mandate of the church to “disciple the nations.” Emphasis is also given to the preparation and dissemination of information, books and practical tools designed to assist members in missionary training, missionary service and mission-related administration. Membership: Full membership to EMS is open to all of the following persons active or retired, who subscribe to the doctrinal tenets of the Society: a) missionary/missiologists; b) professors of Missiology and closely allied disciplines; c) mission administrators and pastors with strategic missiological interests. Associate Membership is open to: a) evangelicals who have competence in any field related to missions, and who support the purposes and doctrinal tenets of the society. Organization: Organizationally, provision is made for the election of national and regional officers with annual meetings to be held both at national and regional levels in the U.S. and Canada. Since 2003, David Diaso has served as the coordinator for the Rocky Mountain Region. Click Here to Download Brochure (375k, pdf). Click Here to Download Fliers (721k, pdf). Click Here to Download Poster (735k, pdf).